MANILA, Philippines - (Updated December 20, 2015) The country's largest chain of shopping malls SM Supermalls released the 2015 Christmas Holidays and New Year 2016 mall hours schedule for Metro Manila and provincial malls. On its Facebook page, SM announced schedule per branch. 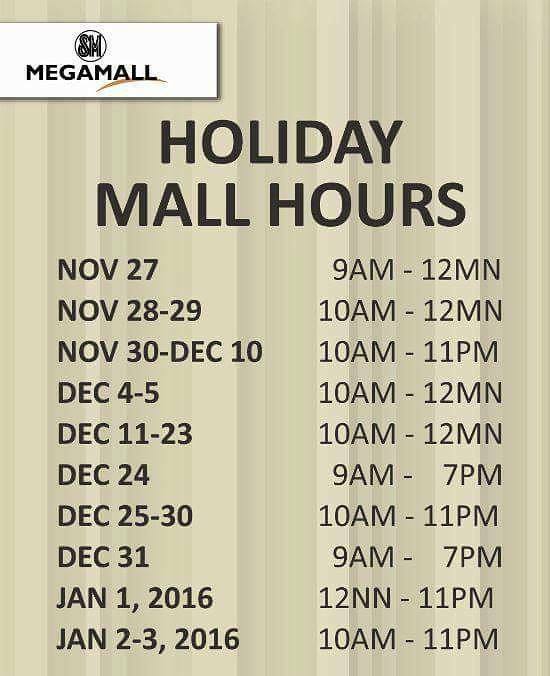 Majority of the shopping malls will open at 9:00 a.m. on December 24 and 31 and will cut short its operation hours due to December 25 Christmas and New Year celebration. 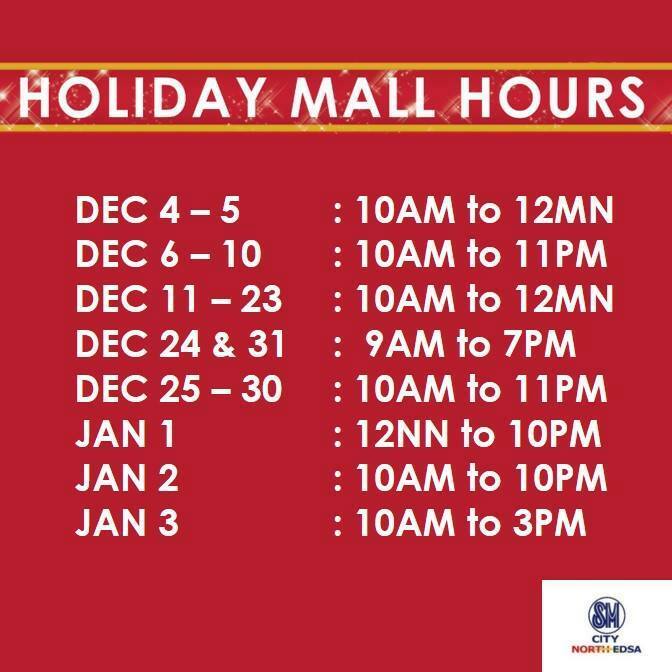 On December 25, select SM malls in Metro Manila and provincial areas will open at 10:00 a.m. and will close at 10:00 p.m. (extended mall hours for Christmas). Last year, SM Cinema opened as early as 8am to give way for the annual Metro Manila Film Festival (MMFF). Shoppers are expected to flock at SM malls to purchase gifts for their loved ones, shop or watch their favorite MMFF 2015 entries. 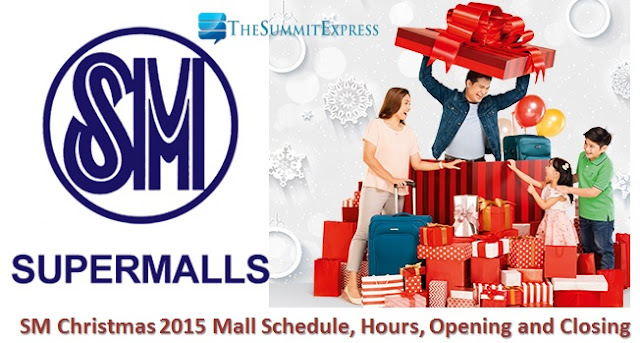 For the shoppers who want to enjoy the luxury of avoiding traffic jams, mall schedule is very important. Most shoppers want to beat the deadline of giving gifts to their friends and family members. Thus, it would be better to get the gifts wrapped before Christmas. 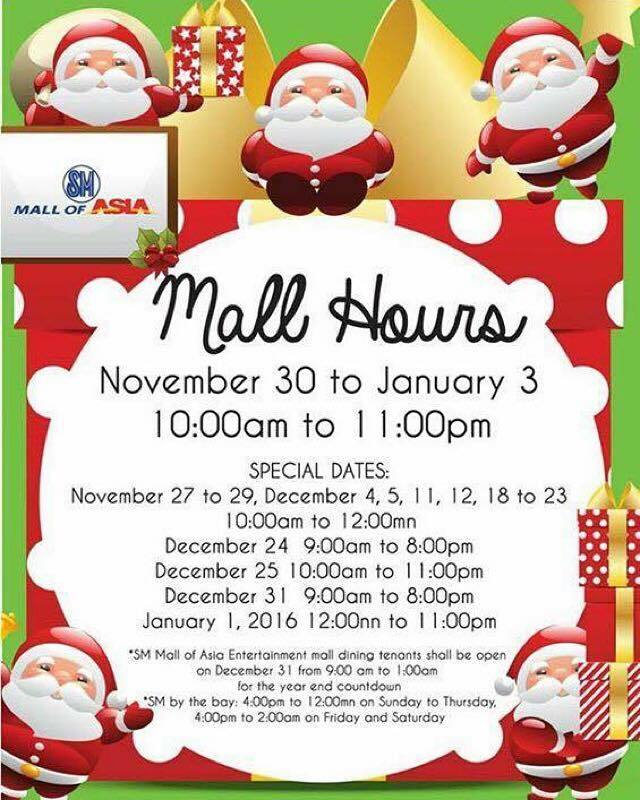 December 18 to 23: 10 a.m. to 12 a.m.
December 24 and 31: 9 a.m. to 7 p.m.
December 25: 12 p.m. to 10 p.m.
December 26 to 30: 10 a.m. to 10 p.m.
December 13 to 23: 10 a.m. to 12 a.m.
December 24: 9 a.m. to 7 p.m.
December 25 to 30: 10 a.m. to 11 p.m.
January 1: 12 p.m. to 11 p.m.
January 2-3: 10 p.m. to 11 p.m.
December 25: 10 a.m. to 11 p.m.
December 26 to 30: 10 a.m. to 11 p.m.
January 1: 12 p.m. to 10 p.m.
January 2: 10 a.m. to 10 p.m.
January 3: 10 a.m. to 3 p.m.
December 13 to 17: 10 a.m. to 11 p.m.
December 24: 9 a.m. to 8 p.m.
December 31: 9 a.m. to 8 p.m.
December 24: 9 a.m. to 11 p.m.
December 25: 12 p.m. to 11 p.m.
December 31: 9 a.m. to 11 p.m.
December 13 to 23: 10 a.m. to 10 p.m.
December 25: 10 a.m. to 10 p.m.
January 1: 12 p.m. to 9 p.m.
December 13 to 17: 10 a.m. to 10 p.m.
December 18 to 19: 10 a.m. to 12 a.m.
December 20 to 23: 10 a.m. to 10 p.m.
December 13: 10 a.m. to 12 p.m.
December 14 to 17: 10 a.m. to 10 p.m.
December 18 to 20: 10 a.m. to 12 a.m.
December 21 to 23: 10 a.m. to 10 p.m.
December 20 to 23: 10 a.m. to 11 p.m.
December 13 to 18: 10 a.m. to 11 p.m.
December 19: 10 a.m. to 12 a.m.
December 13 to 18: 10 a.m. to 10 p.m.
December 20: 10 a.m. to 10 p.m.
December 21 to 23: 10 a.m. to 11 p.m.
December 18 to 19: 10 a.m. to 11 p.m.
December 18 to 20: 10 a.m. to 10 a.m.
December 21 to 23: 10 a.m. to 9 p.m.
December 25-30: 10 a.m. to 9 p.m.
January 1: 11 a.m. to 9 p.m.
December 20 to 22: 10 a.m. to 10 p.m.
December 23: 10 a.m. to 12 a.m.
SM currently has 55 malls located across the country. Once schedule for other branches are available, it will be added in the list above. Be sure to Like Us on Facebook, Follow Us on Twitter or Subscribe to our email list to receive updates.